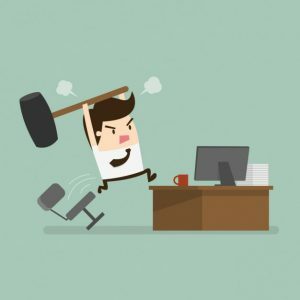 A quick announcement that some of the earlier videos within the blog and located on the Imperial Video Server are currently not playing. It seems that videos posted from December 2009 to around November 2012 will no longer play within the blog. Well here we are in 2019 and the 10th year of the Video Archive Blog. The first real blog of the year is coming up next and that will be a bigger than usual read too. 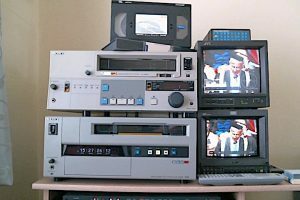 I’m still finding interesting video gems to post and there are masses of new videotapes to be viewed and digitised during 2019. I just have to get to them and sort them out. 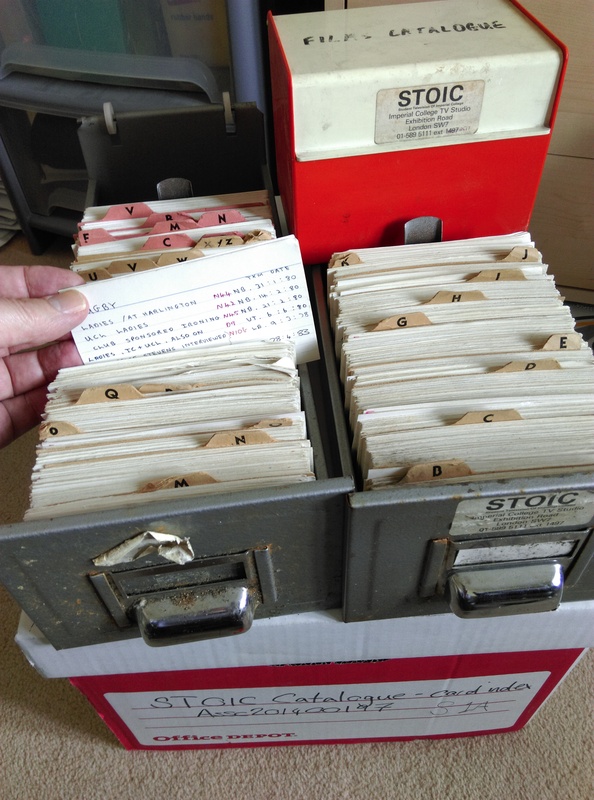 Assisting me now is the original card index files started by STOIC the student TV service (right). Amazingly, their original archive has more ‘college’ events than the TV Studio’s own archive. STOIC covered just about anything and anywhere, to fill the news programmes. There are interviews with college personnel and administration that I never had the opportunity to record myself. They also captured and covered more college events than I did, so these are true archive gems. By now you’re thinking ‘why didn’t the TV Studio cover these things rather than the students?”. Well, the answer is simple, I wasn’t allowed to. We had a remit to charge for any work we did in the college TV studio, so unless someone was paying me, I couldn’t do the work! It’s sad to know that the only coverage of some important and unique college events are only on STOIC tapes. 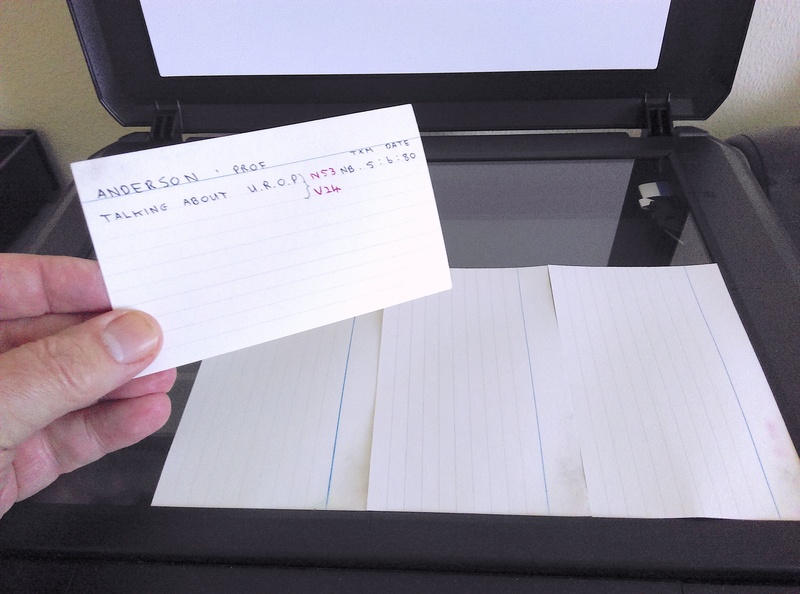 So, fortunately those tapes are now held safely and, as I mentioned previously, I also have access to the two-draw card index that I’m now slowly scanning into digital. 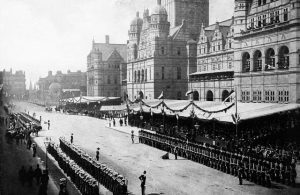 This is a quick and extra post to celebrate the 125 years of the Imperial Institute. There are many references within the blog to both the Imperial Institute and the Queen’s Tower, some of which I have linked here. However, today in 1893 is when Queen Victoria attended the official opening ceremony. These actual photos show the scene just prior to her arrival with all the flags and bunting displayed around the building’s entrance. A special piece of music was written for the day by Sir Arthur Sullivan and was entitled Imperial March which is not to be confused with anything relating to Star Wars for which there is music of the same name. Below is a YouTube link to that piece of music, which was first performed 125 years ago this very day. 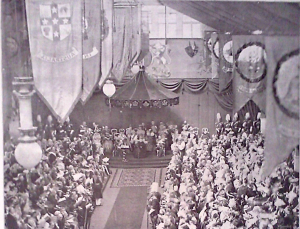 In the photo over on the left you can see Queen Victoria. If you click the image you can see it full size. Look below the canopy and you will see her, still dressed all in black and sitting on a chair. Of course, all that remains of the buildings is what we now call the Queen’s Tower. The bells of the now free-standing tower are still rung on special occasions. Even while the building was slowly going into disuse it was made famous in a brief sequence in an Ealing Comedy, The Titfield Thunderbolt (1953), where a shot is clearly seen of the steps from the building’s main entrance. The building was not actually featured as the institute but rather as a ‘museum’. And yet more STOIC discoveries from 48 years ago. I was at Imperial yesterday and came across something I’d forgotten about and had really meant to do something about years ago. It’s another batch of 8mm films from the STOIC 1970-1972 “TOPIC” and “IC Newsreel” programmes era. A lot of it was shot on colour film stock, even though we only had black and white TV. All manner of things are there too! More of this once I can get them digitised. 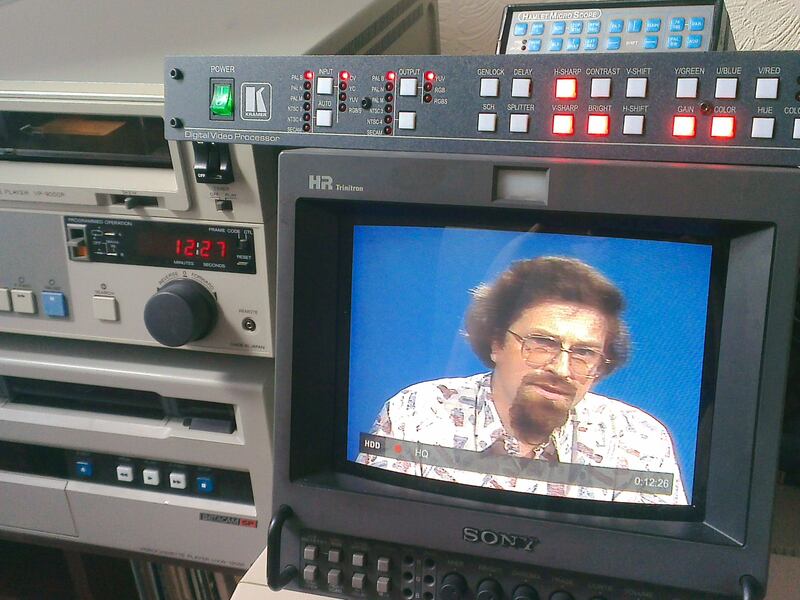 And, just for a change, today I’m digitising two Betacam tapes that are now 16 years old. Commemoration Day 2002 was when Lee Kuan Yew was made a Fellow of Imperial College. The tapes I’m digitising are historic, as it was the first time a Commemoration Day had been recorded in its entirety and that was initially because of the special Fellowship being awarded. I have to say that they are all playing without errors – amazing! Keep checking the Video Archive Blog for some newly discovered videos from 1970 and 1982. 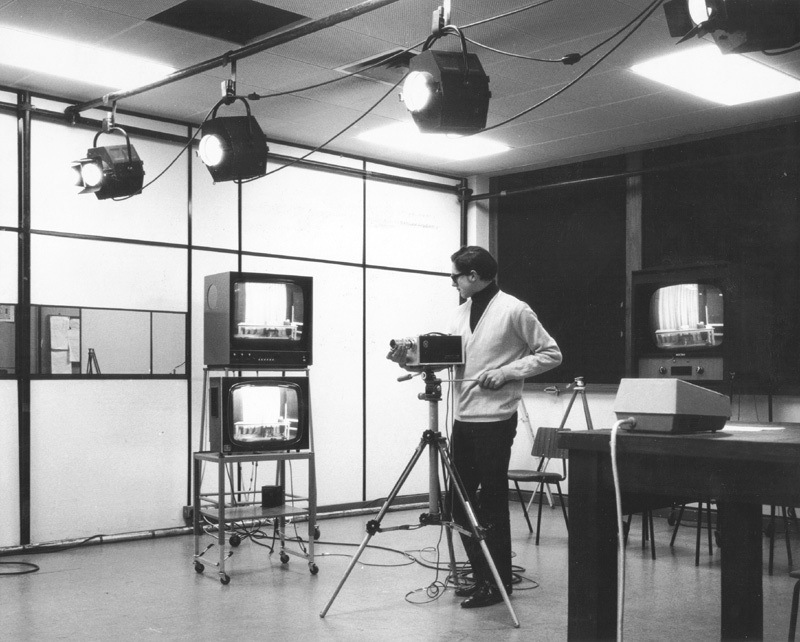 See the origins of the college TV Studio in Electrical Engineering when it first started in stunning black and white! 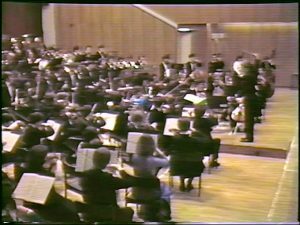 Also see a very youthful Richard Dickins conducting the college orchestra way back in 1982 in the college Great Hall. 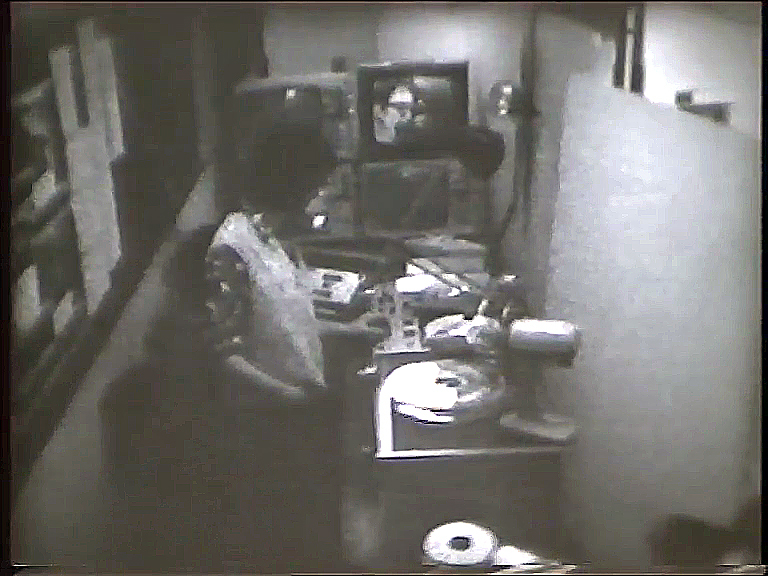 Every week I seem to find something new, hidden away on a reel of videotape. On Monday October 4th 1965 my 50 year association with Imperial College of Science and Technology (no Medicine then) began. It was my first day of working at the most amazing place I’d seen. And, all these years later and even though I’ve retired, my association continues with this Video Archive Blog. If you’ve read or watched some of the videos in the blog then you will have seen various people talking about what the college was like ‘back then’. One quote that Rogers Knight made when we interviewed him in 2006 was that it was ‘a different place back then…’. Although he was referring to pre-war days I can concur with those feelings myself from when I joined Imperial in the 1960’s. Boy, how the place has changed since then. Just look at some of the videos in the blog and you’ll see what I mean. I recall the final fragment of the old Imperial Institute being demolished and Sherfield Building (then called College Block) being built. Before then, the walkway simply stopped at Electrical Engineering. I don’t have any photos from 1965. 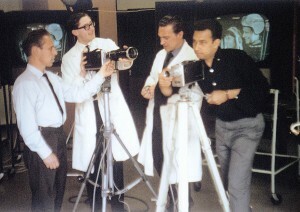 But one photo which was taken, simply for fun, was in August 1967 with three colleagues, including Eddie Bristow on the far left. 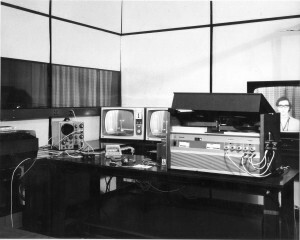 These were the very early days of using video at Imperial and in this case was exclusively in Electrical Engineering which used it for teaching, training and demonstrations. Looking through this blog will give you a better idea of how it’s been used in the years since then. But at the start it was not as easy as it is today. 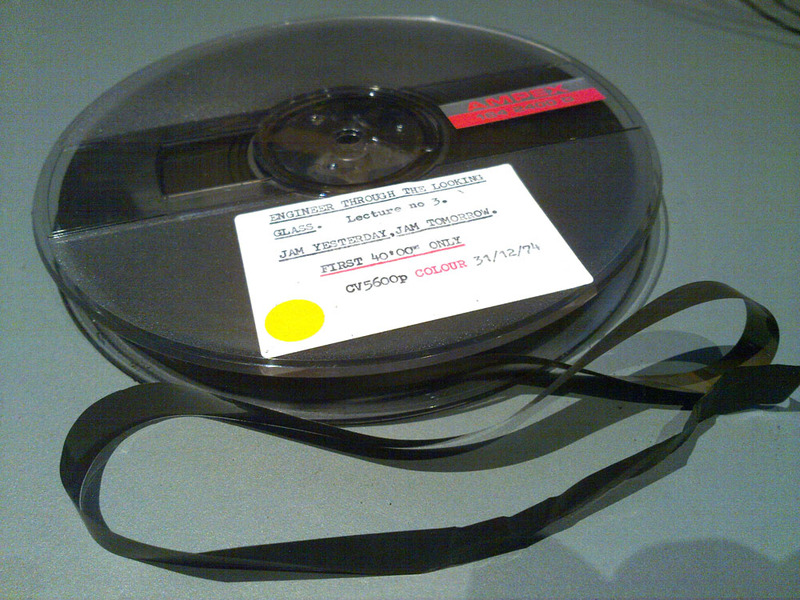 Videotape was the only recording method and even that was, at times, very difficult. 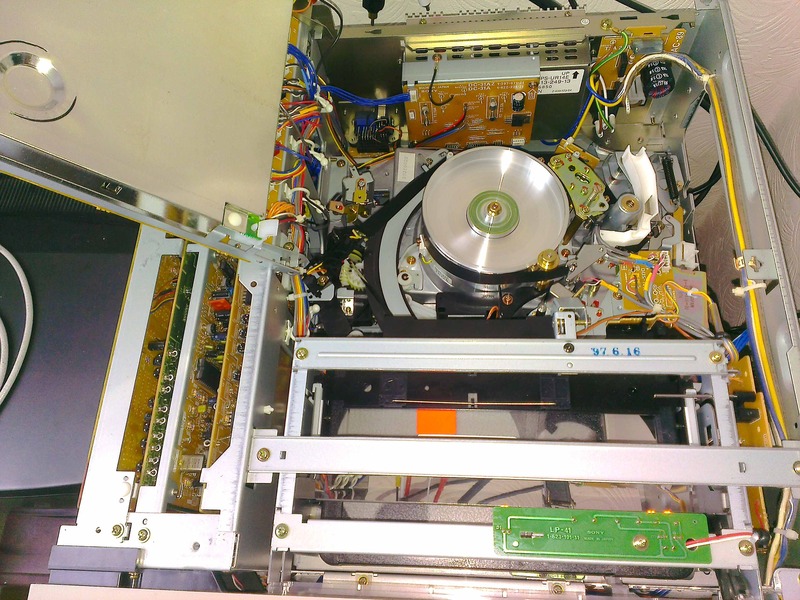 In the black and white photo you’ll see our pride and joy, a Philips EL3400 one inch videotape machine which was FULL of valves and got extremely hot. Could you imagine anything running with valves these days? The image you can just see on the screen really is off of the videotape, the quality of which was none too bad. When you consider that videotape was only in service in the USA around ten years prior to when this photo was taken, great developments had taken place to achieve what was possible with this Philips recorder. Soon after, we replaced the recorder with an Ampex (one inch Ampex tape seen on the right), made by the company that produced the first videotape recorder in the USA about ten or so years earlier. 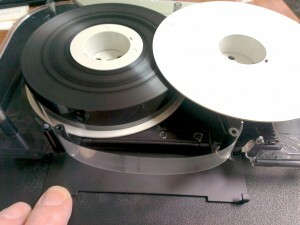 We stayed with this format until 1979 when we eventually switched into colour, using the Sony U-matic cassette format. 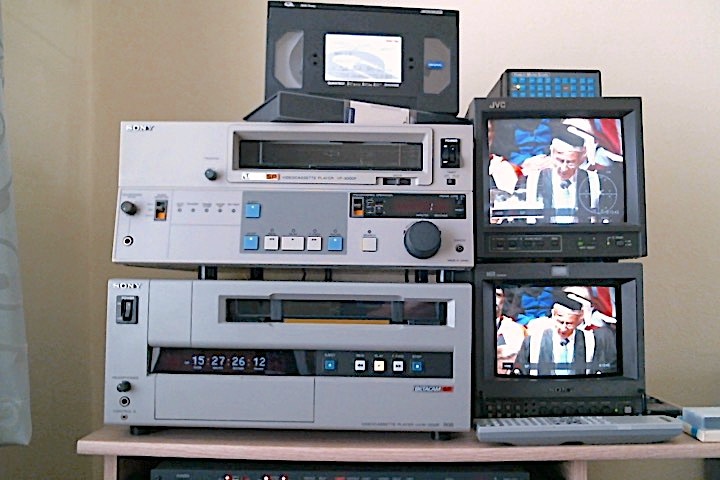 If you read my two blogs on the MANY problems trying to now access these archive videotapes you’ll appreciate the saying “I wished we’d realised back then…”. And finally, as this is a somewhat self-indulgent blog, here’s something almost 50 years old, but in fact it’s only 45 years ago. 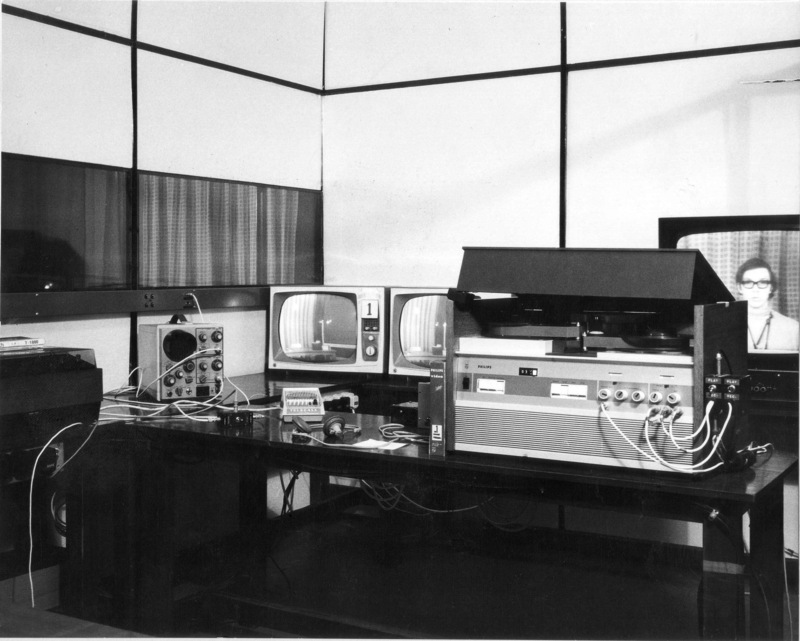 In early June 1970 I made a demonstration video for an Electrical Engineering student who had made a very basic video effects unit for the TV Studio. 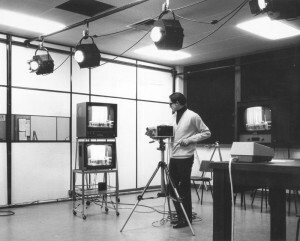 It was a crude demonstration because of the way the studio cameras were then able to run, but it made the point I think. This is just about the oldest video I have and I was just 19 years old, how times change! A former Imperial colleague of mine, Steve Bell, points out that there are not many people who can say they have a video of themselves that’s 45 years old. After some effort, the final batch of videos we made in conjunction with the London Mathematical Society (LMS) have now gone live on the Imperial YouTube channel. The final 6 videos now concludes the upload of all of the remaining LMS lectures in our video archive. The previous blog about the LMS videos explains all the details of how and why we recorded them, so going there will fill in all the gaps. As usual, it was the same old problem and story of oxide and goo shedding from the U-matic videotapes. I explained all of this in the blog about beating the goo, but it involves taking the cassettes apart (seen on the left with just the spools of tape showing) and heat treating them. Needless to say, this is a time consuming process taking at least a day before you can find out whether or not the tape will playback well enough to digitise. If not, then you start the process all over again! So a good few weeks went by before I could end the upload process. Heat treating or Baking as it’s called, is now considered (and used throughout the World) as a method for overcoming playback problems when most other things have been tried and failed. So, this week I attempted this approach myself. 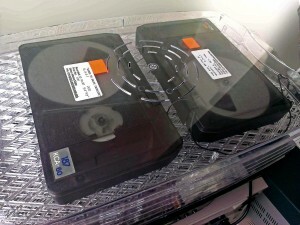 You need a way of continuously heating the tapes to between 50-54oC and for several hours. Not wanting a lab oven here at home (where I’m slowly transferring the archive) I resorted to the other suggested method of using a digital controlled food dehydrator. Ebay to the rescue and installation complete (pic above) my first attempt was carefully monitored with an external temperature probe during the few hours that I heated the tapes for. I had partial success when running the first tape, but it needed a bit more treatment. I also discovered that the inside of the actual tape cassette has small plastic guides which were also getting goo on them. 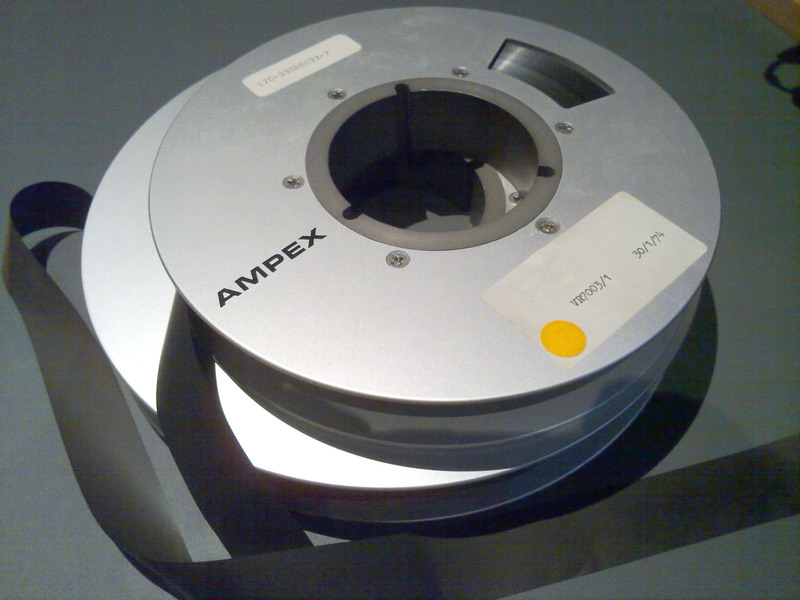 This was causing more problems than inside the actual tape machine. So, take the tapes apart (pic on right), clean the guides, heat them again, let them cool down and reassemble. Success with the first tape! It played back all the way through and was now onto DVD. 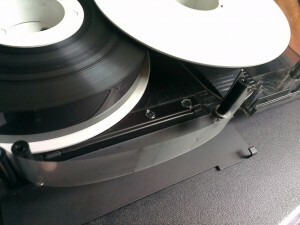 The next tape was still causing problems and I soon discovered the typical screeching noise was now coming from inside the cassette rather than the playback machine. Looking at the cassette I could see that the interior plastic guides were once again coated with goo (pic on left). I put my finger on the guide and it stuck there like sticky tape! So, after taking the cassette apart for the third time and cleaning the guides it played OK. Interestingly I’ve not found any references to these guides inside the cassettes being part of the problem, it’s only references to inside the tape machine. Anyway, the last tape is now onto DVD. A saga indeed and very time consuming (two days for two tapes), but a great feeling of success when I beat the Goo. Baking is THE way it seems. All I have to do is now work my way through the other few hundred video tapes. Incidentally, these current tapes are all from our Maths series made with the London Mathematical Society (LMS) and are now on the YouTube channel in the LMS Playlist. 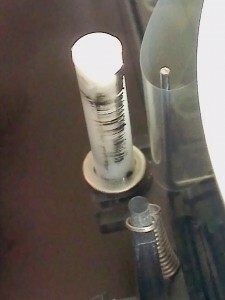 The picture below is of the first successful replay after heat treatment of tape number one. It needed a touch of tender care with TBC adjustments for brightness, colour, sharpness and so on, but looks pretty good after 27 years of being on a cupboard shelf. This is an update to the original entry earlier this year. 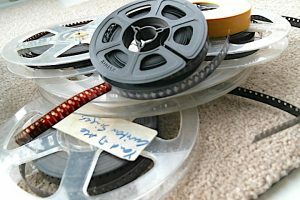 Pathe have just released all of its archive onto YouTube, so I am now able to bring you the film clip direct and in higher quality, rather than going via their own website. 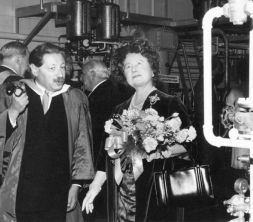 In November 1965 the late Queen Elizabeth the Queen Mother visited Imperial College to officially open the newly completed Department of Biochemistry, headed by Sir Ernst Chain (1906-1979). What you will see are the original 1965 (silent) film rushes shot by Pathe News for its weekly newsreel, shown in cinemas at that time. These newsreels ended in 1970. It is to be assumed that the final edited film (if that ever happened) would have had a commentary on it, but this is all silent. This film record by Pathe is one of the few that were shot on campus at this time. 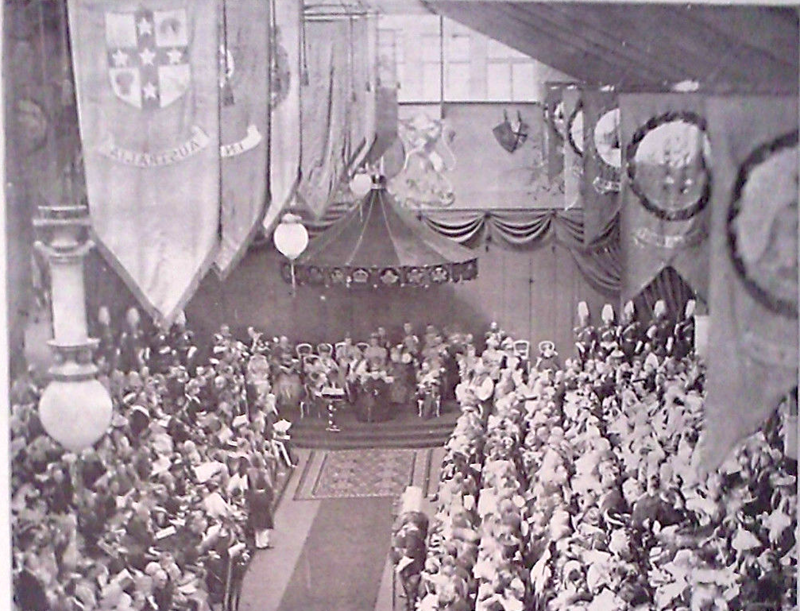 Sequences include the arrival, at the old college Exhibition Road entrance; Sir Patrick Linstead (Rector), Sir Ernst Chain and Lord Sherfield (Chairman Governing Body) all greeting the Queen Mother upon her arrival. This film would have been shot some 8 months before the sudden death of Linstead. You will also see the very obvious building work taking place across the entire campus, with a complete gap where Sherfield and the library now stand. Finally and most importantly, there are shots of Chain in his laboratory, something that we do not have in our own archives. Were you in the crowd that day? Maybe you are one of the students lining up to speak with the Queen Mother at the end of the film? If you are, then do let us know. 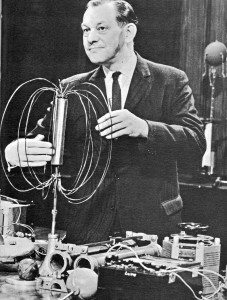 Eric Laithwaite was the first person to present the Royal Institution Christmas Lectures on television in 1966 on BBC2 (in black and white). 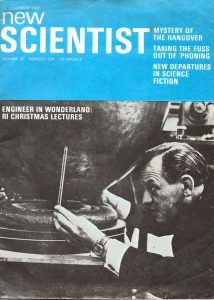 The New Scientist photo below is the front cover from December 1966 previewing the forthcoming lecture series. That lecture series was called The Engineer in Wonderland. In my previous blog on Eric Laithwaite you will find references to both that lecture series and also the second series he was asked to give in 1974. I was present at some of the lectures in both of those years. Now, the Royal Institution has made available, via their web site, all of the 1974 Christmas Lecture series The Engineer Through the Looking Glass. For those interested, it’s a treat to see him at his best, in front of a live audience! You will see below a list of the six lectures in that series. 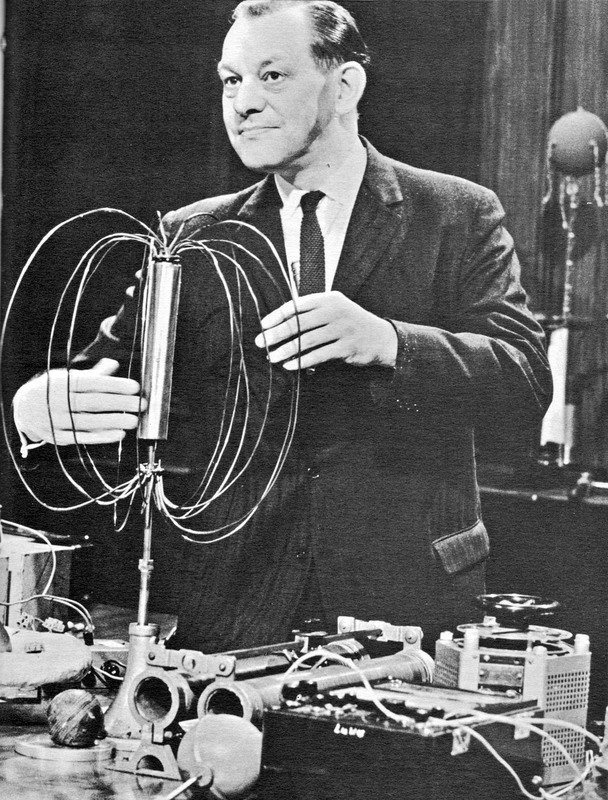 You may recall that there was some controversy over the content of lecture six where Eric Laithwaite demonstrated his theories of gyroscopes and how he thought he may have found that gyroscopes violated the law of conservation of energy. It appears that Laithwaite was waiting for the sixth and final lecture with something new and controversial, possibly breaking these laws of science. I have recently found the BBC archive pages of past editions of Radio Times. 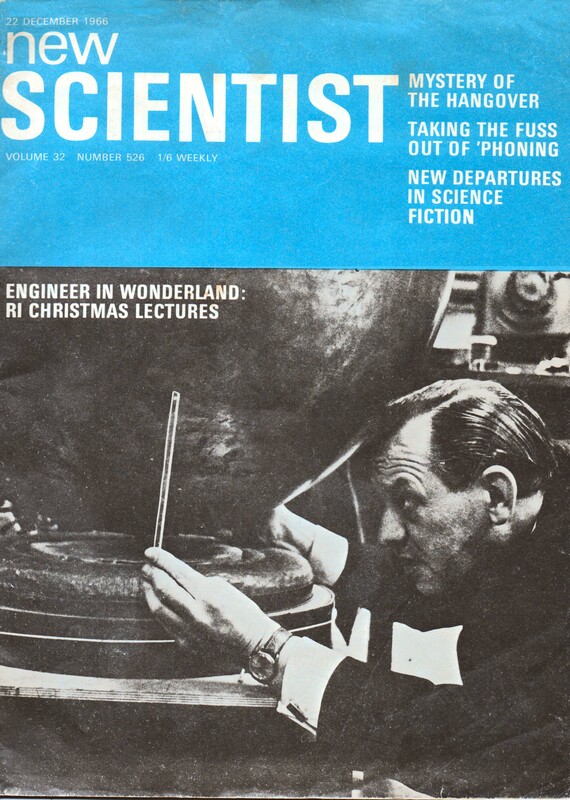 In them, I found the references and listing for the 1966 RI Christmas Lectures (The Engineer in Wonderland), the first to be televised and also given by Eric Laithwaite. The listing for the sixth and final lecture is interesting. Although I was actually present at that lecture I don’t remember the content, but the listing reference is very, very interesting it reads “Professor Laithwaite tries a completely new experiment which he hopes will break one of the laws of science. All the text books say it cannot be done. Will the experiment succeed?“. So, here we are again in 1974 with the sixth and final lecture (It’s my own invention) and once again Eric Laithwaite is trying something new, controversial and possibly breaking the laws of science in the process, is this a repeat of his idea from 1966? I must admit I hadn’t realised this until now! Maybe only he remembered the wording from that 1966 lecture? We’ll never know….